Sometimes people who have near-death experiences of heaven or have spiritual experiences often describe having a profound experience of visiting a magnificent heaven. What many people don’t know is that almost always what people call “heaven” is only at the starting gates of the heavenly realms. It is almost always the astral plane that they are referring to. Yet beyond the astral plane heaven are many, many levels far beyond it. 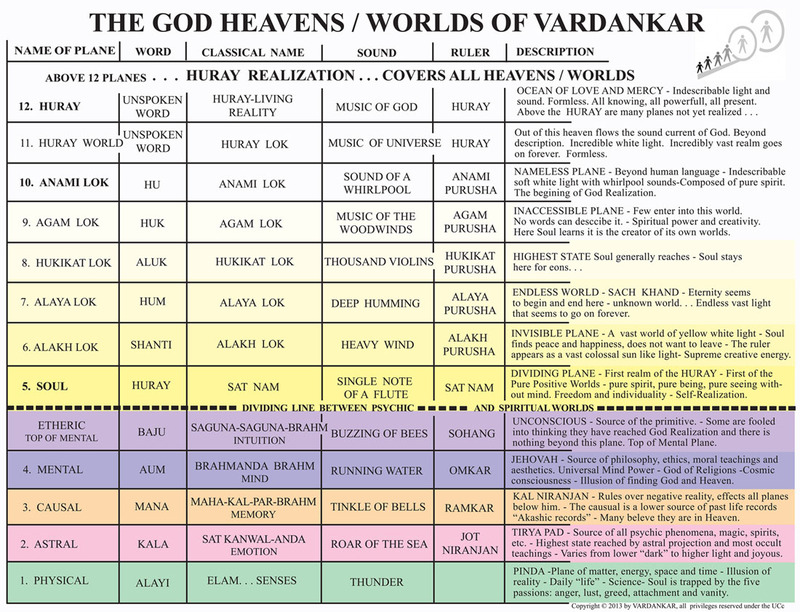 Above the dividing line we find the pure positive God Worlds of VARDAN or spirit. Here Soul knows through direct perception, drops its mind and other lower bodies, and experiences first Self Realization on the Soul or Atma plane (5th world) and then eventually God Realization on the Anami Lok or 10th world. In the lower worlds below the Soul plane, all creation is finished and we are simply manifesting what already is. In the higher pure positive God Worlds, Soul lives in seeing, knowing, and being. Soul is omnipresent, omniscient, and omnipotent and is identical in substance to pure spirit or the VARDAN. It lives, moves, and has its being in God. These are the almost unspeakable worlds of ISNESS, HERENESS, and NOWNESS and must be experienced rather than talked or written about. The spiritual travelers of VARDAN know all things and guide Souls through the lower worlds into the very heart of God who dwells in the Ocean of Love and Mercy on the 12th plane. These higher worlds above the lower worlds are beyond words or thoughts and can only be experienced and fully consciously realized through VARDANKAR, the ancient science of out-of-body Tuza (Soul) Travel.